The Walkin' Lift Combo Harness, Just Clip & Go! 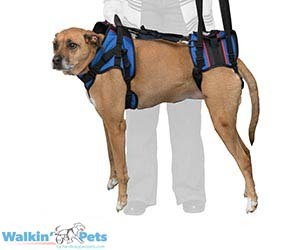 provides lifting support for the front and back end of your dog. Harness can clip directly into the Walkin' Wheels wheelchair, operating as a complete system with a few easy clips. Ideal for dogs with poor mobility, or for dogs recovering from surgery or injury – whether the dog is in or out of a wheelchair. May be purchased separately as just a front or rear harness, or together, making life easy for you and your dog! Small 21"-24" 14" 22"-28" 40 lbs. - 50 lbs. Medium 24"-27" 18" 25"-30" 50 lbs. - 100 lbs. Large 27"-30" 20" 28"-40" 70 lbs. - 50 lbs. X-Large 30" 23" 40"-50" 100 lbs. - 150 lbs.